We are proud to announce our new series of “Molded Graphic” Kits! Combining our high-resolution vinyl graphics with our exclusive quarter round moldings produces a spectacular custom design that is either retro or hi-tech depending on the vinyl chosen. Woody Wagoon's™ traditional “Woody” look is joined by the technical look of simulated Carbon Fiber, and the spectacular appearance of the seven different color-shifting flip-flop materials. These fantastic vinyl's change color as your view of the vehicle changes! The quarter round moldings are color coordinated and size matched to the vinyl for an impressive effect. These kits are designed to be simple enough for the home installer, with the attention to detail professionals demand and appreciate, so they can be installed by the do-it-yourself enthusiast or by one of Woody Wagoon's™ recommended professionals located throughout North America. Also Shown with our Chrome Bumper Trim and Fender Spear Kits. HHR "WOODY" III Styling Kit -Carbon Fiber Please Call! $549.00 Please Call! 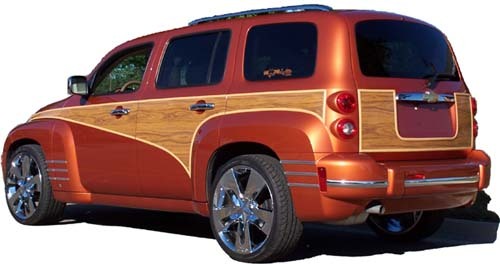 HHR "WOODY" III Styling Kit -Cyan/Purple Please Call! $549.00 Please Call! HHR "WOODY" III Styling Kit -Gold/Silver Please Call! $549.00 Please Call! HHR "WOODY" III Styling Kit -Silver/Green Please Call! $549.00 Please Call! HHR "WOODY" III Styling Kit -Purple/Green Please Call! $549.00 Please Call! HHR "WOODY" III Styling Kit -Blue/Red Please Call! $549.00 Please Call!